Welcome to Bhutan, the Land of the Thunder Dragon. Reaching at Paro International Airport, you will be greeted by your guide upon exiting the arrival hall. Today, we will take it easy to acclimatise to the altitude. 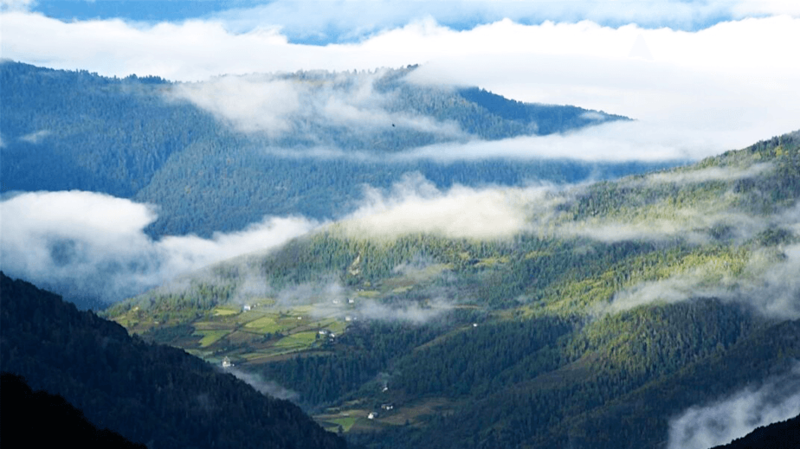 Drive to Thimphu, check in to the hotel and lets have your first taste of Bhutanese cuisine and some light sight-seeing in Thimphu if possible. Takin enclosure - See the national animal of Bhutan, the Takin. Drive from Thimphu to Geynikha. 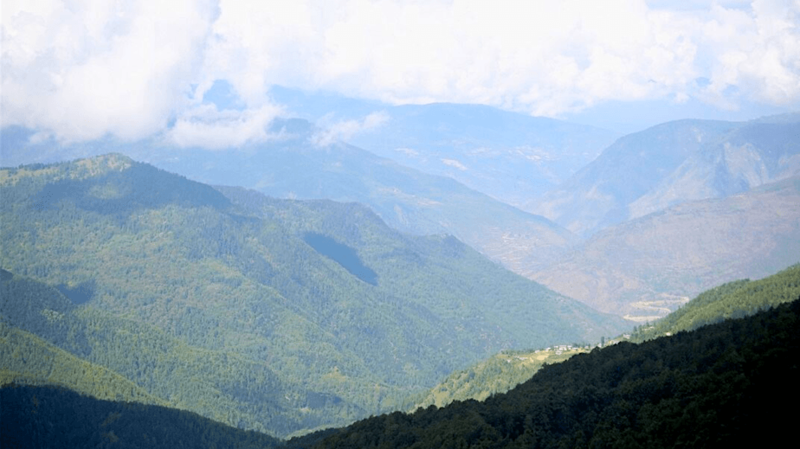 From there we make a climb up to a ruin from which good trail starts descending to the Geynitsang Chhu, passing a small waterfall and an irrigation channel built on some stakes till the first campsite is reached. If we arrive at camp early, we will visit the villages Zamto and Chhochhekha up the valley. Leaving campsite we make a steep climb and then steadily through the oak forest. The trail becomes less steep, skirting around the hillside through a big birch forest that gradually gives way to bamboo. Soon we reach our campsite Gur. We could have reached this place in a day, but Gur is about 1,000m higher than Thimphu so we have to watch the altitude. 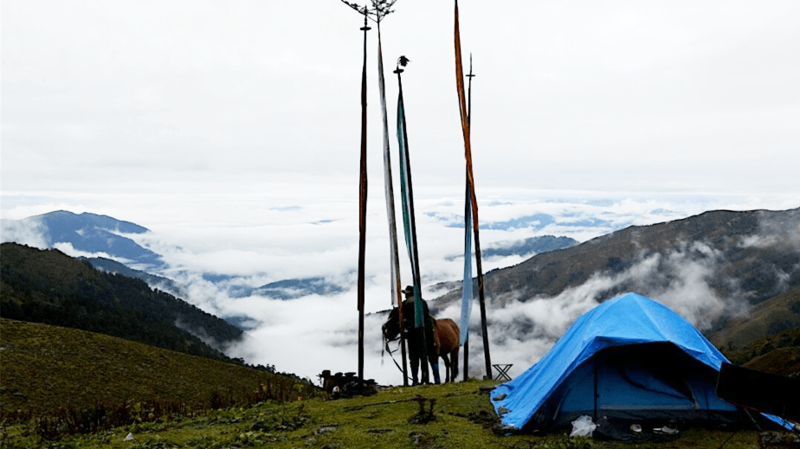 Gur camp is just within the recommended height gain between campsites. A clear and wide trail leads us to a beautiful high altitude landscape with gentians and a fine view of the Dagala Range including some rocky peaks. Soon we enter a broad main valley where there a are quite a few yak herders huts. We continue to the end of the valley and camp just below the cliffs near the lake. If you have obtained a fishing permit, enjoy some golden trout fishing. The lower route crosses a pass of 4300m. The pack animals and horsemen uses this trail since it is easier. 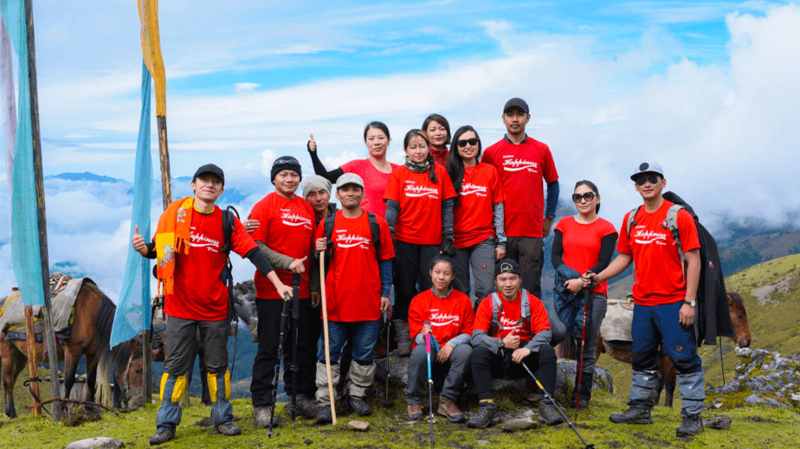 Alternatively, adventurous travellers can take the high route reaching altitudes of 4520m and is even higher if you want to climb to a viewing point , Jomo Peak (4716m). The Jumolhari and Kanchenjunga can be seen on a fine weather. Several short climbs follow in and out of minor valleys finally reaching a small saddle with a cairn. Then we make the last climb for the day before reaching our campsite at Kiwi Chowa next to a little stream. We climb to a pass where four trail meets. We take the trail goin towards Talakha Gompa. On our trek to Talakha Gompa, we have to be careful because there are big loose stones, very unpleasant for horses. It leads us to a meadow from where we make a final long descent through mixed fir, juniper, and rhododendron etc. We will reach the beautiful Takakha Gompa with a well looked after garden with a superb view of Thimphu Valley. Below the gompa is the road where our transportation will be waitin for us to take us to Thimphu. Paro Dzong - Also known as Rinpung Dzong, this 15th century massive fortress/monastery, is also the administrative center of the dzonkhag. Taktsang Monastery - A one hour hike to the cafeteria is also a vantage view whereby you can enjoy the stunning view of the monastery. Prayer flags adorn the cliff and this is also where Guru Padmasambhava landed on the back of a tigress in the 8th century.